Around 1987, started to release many songs as songwriter, recording engineer and producer from both major labels and independent labels. 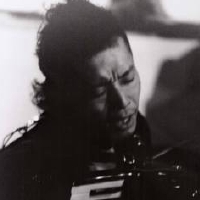 Engaged in various activities including collaborations with many unique artists, such as Kuni Kawachi (contemporary musician), Yoshino Mickey (organ player), Takio Ito (pioneering folk-song singer), Kyosuke Himuro (rock singer). 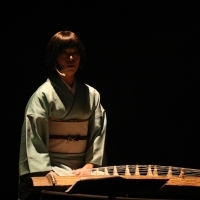 In recent years, often collaborating with players of Japanese instruments (shakuhachi (five-holed bamboo flute), koto (a kind of harp) and shamisen (three-stringed lute)). And having exchanges with many stage creators including Yoko Narahashi (film director, Hollywood casting director) and Masayuki Imai (organizer of a theatrical group, and actor) and engaging in progressive activities also in the field of performing arts other than music. 1992 After closing an interim contract with a record maker, Sony Entertainment, concluded an artist agreement with For Life Music Entertainment Inc.
Ballet School and Tani Momoko Ballet School, belonged to Tani Momoko Ballet Company as a professional dancer and played the title roles of “Swan Lake”, “Paquita” etc. from 1994 to 2007. Theater Ballet in Tokyo in 1997 and having worked for all stages of the company through 2004. While taking major roles in classic-ballet stages, actively working also on creation of contemporary performing arts. Played the title roles of “Swan Lake”, “Paquita” etc. Won the third prize and awarded the IBM prize at the Twelfth All Japan Ballet Competition. Established a performance company, “MI-KUNI” with Jujiro Maegawa etc. 2000, Masaya started his professional career as a drummer / percussionist. Most of his work involved in collaborations with jazz musicians in sessions at live house around Tokyo. 2003, Masaya was taken as an apprentice/assistant of a percussionist Tomo Yamaguchi (well known percussionist in Japan because of his unique talent as a Junk Drum performer). 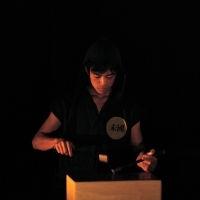 At the same time, he joined "TICOBO",a performance unit of playing original drums and percussions made by obsolete materials which was established by Tomo Yamaguchi. He performs at live event, concert, workshop and TV shows(which are widely broadcast) across Japan up to the present date. BODY, RHYTHM and LIFE by Japanese and Eastern philosophy. Tokyo National University of Music graduate. and Music Special Training Course of Aichi Meiwa high school. She is performing both domestic and overseas. He wandered in Asian countries, and acquired accomplishments as a musician. After returning to Japan, he studied from Ichiro Seki.